In the previous article (http://ponnadi.blogspot.in/2013/06/anthimopaya-nishtai-12.html), we observed that AchAryan is an avathAram of bhagavAn and he should be treated as such only. We will continue with the section which explains the ill-effects of considering the AchAryan as a mortal human. Simple translation: One should undergo panchasamksAram and learn artha panchakam from the AchAryan. Realizing the 3 attributes of AchAryan (ananyArhathvam, ananya sEshathvam, ananya bhOgyathvam), one should meditate on a pure bhAgavatha. One should live close to the mahA bhAgavatha to purify fully. It is said that, that place is most sacred and the water (source) nearby is fully pure (to purify us) and that is the auspicious abode of srIman nArAyaNa. pAttuk kEtkumidamum, kUppIdu kEtkumidamum, guthiththavidamum, vaLaiththavidamum, Uttumidamum ellAm vaguththavidamE enRirukkakkadavan. பாட்டுக் கேட்குமிடமும், கூப்பீடு கேட்குமிடமும், குதித்தவிடமும், வளைத்தவிடமும், ஊட்டுமிடமும் எல்லாம் வகுத்தவிடமே என்றிருக்கக்கடவன். Thus, a sishya should consider the AchAryan as the lord of both paramapadham and samsAram and also should consider that the AchAryan is the greatest wealth to be attained in both worlds. As said in "sAkshAn nArAyaNO dhEva: kruthvAmarthyamayIm thanum" (ஸாக்ஷாந் நாராயணோ தேவ: க்ருத்வாமர்த்யமயீம் தநும்), without understanding that bhagavAn himself has accepted a human form to uplift them, seeing that he is also eating, sleeping, etc and considering AchAryan as humans like us as said in "mAnidavanennum guruvai" (மானிடவனென்னும் குருவை - gyAna sAram 32), "gyAnadhIpapradhE gurau marthyabudhdhi srutham thasya" (ஜ்ஞாநதீபப்ரதே குரௌ மர்த்யபுத்தி ச்ருதம் தஸ்ய), "yO gurau mAnusham bhAvam" (யோ குரௌ மானுஷம் பாவம்), "gurushu naramathi:" (குருஷு நரமதி:) is severely condemned. We will see the ill-effects of considering AchAryan as a mortal being just once, in the next sections. Simple translation: Both valuing the divine archai form of vishNu based on the metal (raw-material) the form is made off and considering ones own AchAryan as mere mortal being will surely lead one to the hellish planets. Simple translation: Just like the sun which nourishes the lotus will itself scorch the flower when the flower comes out of water, for the ones who give up the attachment from their guru, srIman nArAyaNan (who helps everyone) himself will lead to their suffering. Simple translation: The one who ignores his AchArya who blessed him with knowledge, he is to take birth as chaNdALa (dog-eater) for 100 times. Simple translation: One who gives up his guru is as good as a dead body; one who gives up the manthram (learnt from guru) is penniless. One who gives up both the guru and the manthram is sure to reach the rauravam hell. Simple translation: One should give up the association/relationship with such persons who dont consider their wealth, lands, salvation and dharmam, etc as their AchAryan who instructed the ashtAkshara mahAmanthram. Simple translation: The one considers the AchAryan as a mere mortal human and the divine archA form which is cherished by the husband of srI mahAlakshmi based on the metal (raw-material) that is made off - both are destined to the lowest of hellish regions. Simple translation: The sishya who lives in his village not worshipping the AchAryan and engaging in activities without taking AchArya prasAdham is indeed an animal. Simple translation: One who gives up the guru who is easily accessible but approaches bhagavAn, is like a thirsty person dropping the water in the hand and looking up for rain in the sky. Simple translation: Worshipping bhagavAn directly instead of accepting the AchAryan (who is easily accessible to us) himself as bhagavathavathAram is like giving up the wealth which is right with us and searching for treasure buried by some one else under the ground. Simple translation: bhagavAn who is most merciful and favourable towards everyone himself will give up on a jIvAthmA when the jIvAthmA does not show love/attachment towards his/her AchAryan. This is like Sun that nourishes the lotus flower itself will dry it when the lotus flower gives up the connection with water. Simple translation: AchAryan is the one who blesses us the lotus feet of bhagavAn. The ones who worship such AchAryan as bhagavAn himself will surely attain the glorious life in paramapadham. The others who does not accept and worship their AchAryan will eternally suffer in this world. Simple translation: The ones who does not serve the lotus feet of their own AchAryan, even if they show great attachment towards emperumAn, srIman nArAyaNan will not bless them with the blissful life in paramapadham, so they are not going to reach paramapadham. Simple translation: One who stays away from his AchAryan deserves to be abandoned. Simple translation: Considering the archA form of vishNu as just a statue, considering a guru as a mortal human, analysing the birth of vaishNava, Considering the srI pAdha thIrtham of vishNu and vaishNavas which can remove all ills of kali as just plain water, considering the words that glorify their (vishNu and vaishNavas) names, temples, etc as ordinary words and considering srIman nArAyaNan equal to other dhEvathas will surely lead one to hellish regions. Insulting guru includes the following aspects. Giving up the association of AchAryan - as said in srIvachana bhUshaNa dhivya sAsthram 439 "thAmaraiyai alarththakkadava Adhithyan thAnE nIraip pirinthAl aththai ularththumApOlE, svarUpa vikAsaththaip paNNum Isvaran thAnE AchArya sambandham kulainthAl aththai vAdap paNNum" (தாமரையை அலர்த்தக்கடவ ஆதித்யன் தானே நீரைப் பிரிந்தால் அத்தை உலர்த்துமாபோலே, ஸ்வரூப விகாஸத்தைப் பண்ணும் ஈஸ்வரன் தானே ஆசார்ய ஸம்பந்தம் குலைந்தால் அத்தை வாடப் பண்ணும்) - Just like the sun which nourishes/blooms the lotus will itself scorch it when the flower gets separated from water, bhagavAn who nourishes the knowledge of the jIvAthmA will diminish that knowledge when the jIvAthmA gives up the association of the AchAryan. gurOrapahnuthAth thyAgAth asmaraNAdhApi; lObAmOhAdhipischAnyair apachArair vinasyathi (குரோரபஹ்நுதாத்(?) த்யாகாத் அஸ்மரணாதாபி; லோபாமோஹாதிபிஸ்சாந்யைர் அபசாரைர் விநஸ்யதி) - He, who abandons his AchAryan, stays away from him and does not think about him, is destroyed by the sins arising out of greed and delusion. gurOranruthAbisamsanam pAdhakasamAnam kalu gurvarththE sapthapurushAn ithascha parathascha hanthi; manasApi gurOrnAnrutham vadhEth; alpEshvapyarththEshu (குரோரந்ருதாபிஸம்ஸநம் பாதகஸமாநம் கலு குர்வர்த்தே ஸப்தபுருஷாந் இதச்ச பரதச்ச ஹந்தி; மநஸாபி குரோர்நாந்ருதம் வதேத்; அல்பேஷ்வப்யர்த்தேஷு) - Approaching an AchArya with lies is akin to causing him injury. By stealing the property of AchArya, seven generations before and after are destroyed. Thus, never be a hypocrite to your AchArya even in your mind. Do not steal even a small part of of his property. Simple translation: Since AchArya enlightens the sishya with the torch of knowledge, he should be considered as bhagavAn himself. For the ones who considers the guru as a mortal being, the knowledge gained from sAsthram is similar to elephant taking a bath (to only pick up the dirt and place it on its head again). Simple translation: who leaves the easily accessible AchArya and practises difficult upAsanas, is like an idiot who throws away the money already available to him and digs the earth in search of treasure. Simple translation: One who gives up the guru who is near by but approaches bhagavAn, is like a thirsty person dropping the water in the hand and looking up for rain in the sky. Simple translation: Those who address their AchArya by improper language or in a manner to subdue him, become brahmarAkshasAs in a forest without water. Thus, with the above pramANams, AchArya apachAram is fully explained. Translator's note: Thus, we have seen the ill-effects of committing AchArya apachAram. 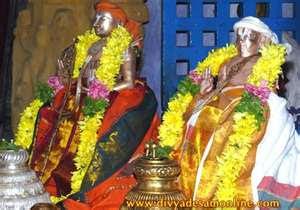 In the next section we will see more pramANams for bhAgavatha apachAram.